Surf News Network, 5 April, 2015. Oceanside, California – The largest and most historically significant collection of surfing’s film history is encapsulated in an extraordinary collection known today as the Bud Browne Film Archives. Composed of surf films created by the father of the surf film genre, Bud Browne, it is undoubtedly the most comprehensive collection of surf film history in the world. The woman behind the collection is Anna Trent Moore, who will be presenting a “talk story session” on the late Bud Browne and his legacy in surf history at the California Surf Museum on Friday, April 10th. The following evening, Saturday, April 11th, there will be a special film viewing of Browne’s film, Surfing the Fifties, followed by Q and A with a panel composed of legendary surfers Linda Benson, LJ Richards, and Joel Tudor. Friday is also the debut of “Bud Browne: Surfing’s First Filmmaker,”an exhibit on Bud Browne that will run through the end of the month. It includes a collection of Bud Browne’s surfing images Anna calls “Grab.”Grab shares the unique form of surf images that Browne captured through print work that he froze from film. Anna Trent Moore, daughter of big-wave legend Buzzy Trent, is the owner/curator of the Bud Browne Film Archives. Anna was born and raised on Oahu and often tagged along when Bud filmed her dad and other surfing pioneers charging big Makaha point surf. 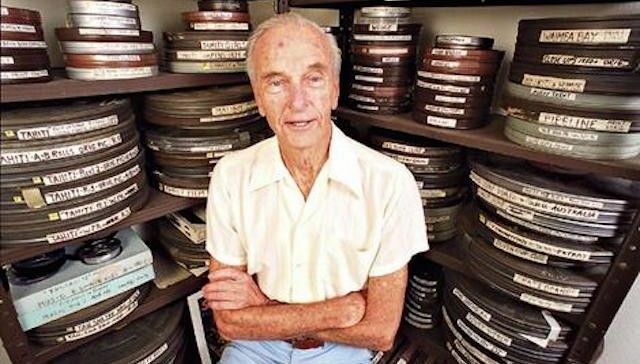 Browne, a soft-spoken filmmaker who remained a bachelor all his life, bequeathed his life’s work to Anna, a longtime family friend, upon his death at the age of 96 in 2008.